128 x 108 in. 325.1 x 274.3 cm. Sotheby’s New York will offer Jeff Koons’s Bread with Egg, a shimmering exemplar of the artist's exacting photorealistic paintings of commonplace objects. Bread with Egg is a further style development on the beautiful Jeff Koons mirror-polished stainless steel sculptures such as Balloon Flowers and Tulips. Estimated at US $3,500,000 - 4,500,000 USD, the painting was offered at the Contemporary Art Evening Auction on November 13th 2012 at Sotheby's New York. 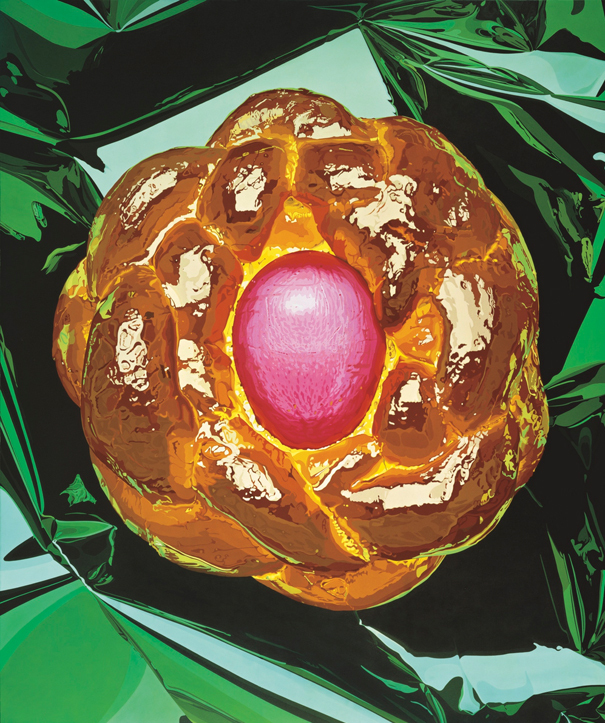 A central painting to Koons’ Celebration series, Bread with Egg 1997 is a shimmering exemplar of the artist’s exacting photorealistic paintings of commonplace objects. Casting a new and inspired light on the familiar and the ordinary has long been central to Koons' oeuvre. Bread with Egg presents the relatively mundane in a truly spectacular and technically flawless way. Koons’ choice of readymade subject is always rigorously considered, even as the objects he selects take the form of dime store figures, household appliances, inflatable toys and children’s playthings. Gunnar B. Kvaran, Director of the Astrup Fearnley Museum in Oslo, has described the essential nature of these choices in terms of “his [Koons’] sincere conviction that such populist aesthetic references have artistic potential, and that the notion of art is so open and flexible that it can be manipulated or changed according to the artist’s intention” (Exh, Cat., Oslo, the Astrup Fearnley Museum of Modern Art, Jeff Koons: Retrospective, 2004, p. 24) It is with this openness to the acceptance and celebration of artistic potential that Bread with Egg, 1997 connects to the heart of Koons’ body of work and to the wider reach of still lifes and ready-mades that span the history of art in the 20th century and beyond. As Arthur Danto has noted, “Koons has found a way of making high art out of low art – but in a way that would not have been a possibility until the conceptual revolutions of Duchamp and Warhol.” (Ibid., p. 126) Duchamp’s bicycle wheels and Warhol’s soup cans certainly form the lineage from which Bread with Egg, 1997 emerged, as do Claes Oldenburg's Store sculptures. Certainly Pop Art has a special resonance for Koons who is engaged with a continued exploration of the modes and ideas he so admires in the Pop lexicon. 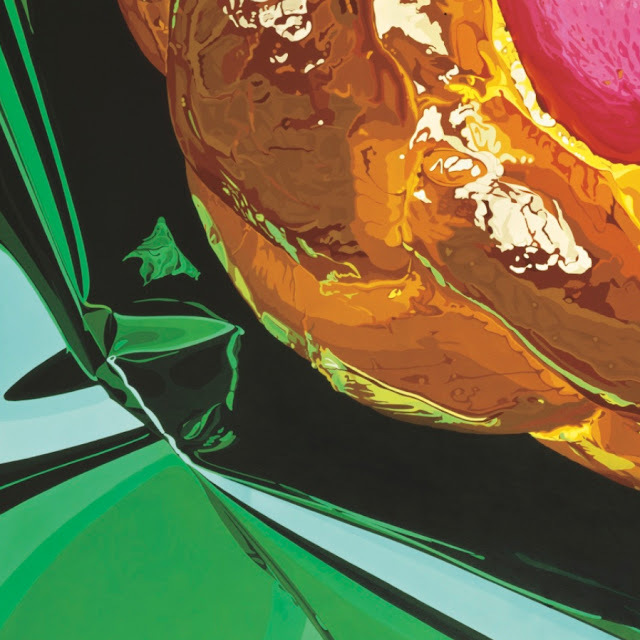 In addition to Andy Warhol’s work, the paintings of James Rosenquist have inspired Koons with their bright colors, smooth almost commercial application of paint, use of popular subject matter and elements of dynamic collaging of imagery. All are touched upon in Koons’ paintings and in the Celebration series, Koons describes how “the paintings went through this process of being stylized into a kind of superrealism…” (Exh. Cat. Berlin, Deutsche Guggenheim, Jeff Koons: Easyfun-Ethereal, 2000, p. 25) This “superrealism” gives Bread with Egg its monumental presence and is an intensification of the ideas presented in the works of Warhol, Rosenquist and other Pop artists. The relevance of Koons’ Bread with Egg, 1997 ventures even deeper than 1960s Pop. Koons’ elaborate staging of Bread with Egg mirrors the grand tradition of still life painting established by 17th century Flemish painters. 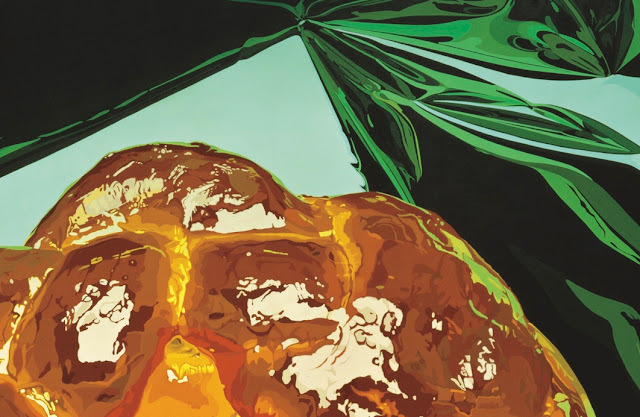 The ornate and sumptuous compositions of the Netherland’s master painters reflect the glossy and tantalizing presentation of Koons’ Bread with Egg. Where the traditional still lifes of the 17th century often depicted luxury items or objects symbolic of religious themes or moralizing instruction, Koons chooses a common object that seems to underscore the decline of such allegory in contemporary society, all the while reflecting the technical precision instilled in the genre. Koons’ iconography is still a reflection of his time, yet in place of lofty and expensive objects with unknown or obscure histories, Koons enthrones objects that have meaning for mass audiences. Koons explains, “Where I differ is that Warhol believed you could penetrate the mass through distribution and I continue to believe you penetrate the mass with ideas.” (Op. 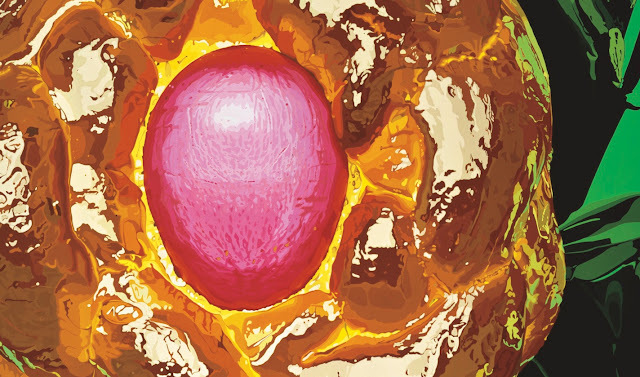 Cit., p. 24) The central object in Bread with Eggs resembles Easter bread which carries the emotional and traditional connotations to the seasonal ceremonies that are particularly connected to experiences in childhood. These emotional associations are heightened as the every-day object is rendered in lavish color with the painstaking labor of the studio assistants who apply the meticulously calibrated pigments. Koons has described his color choices to be “just as simple as a pack of Crayola. You have red, you have blue, you have green, yellow, pink. And that’s it. The color is bright, it’s fresh, and it’s direct.” (Exh. Cat., Chicago, The Museum of Contemporary Art, Jeff Koons, 2008, p. 81) The richness of this still life’s oil paint itself creates a feast for the senses, rendering so perfectly the crust of the bread baked with the glowing red egg at its center and the entire scene illuminated by the shiny green wrapping.